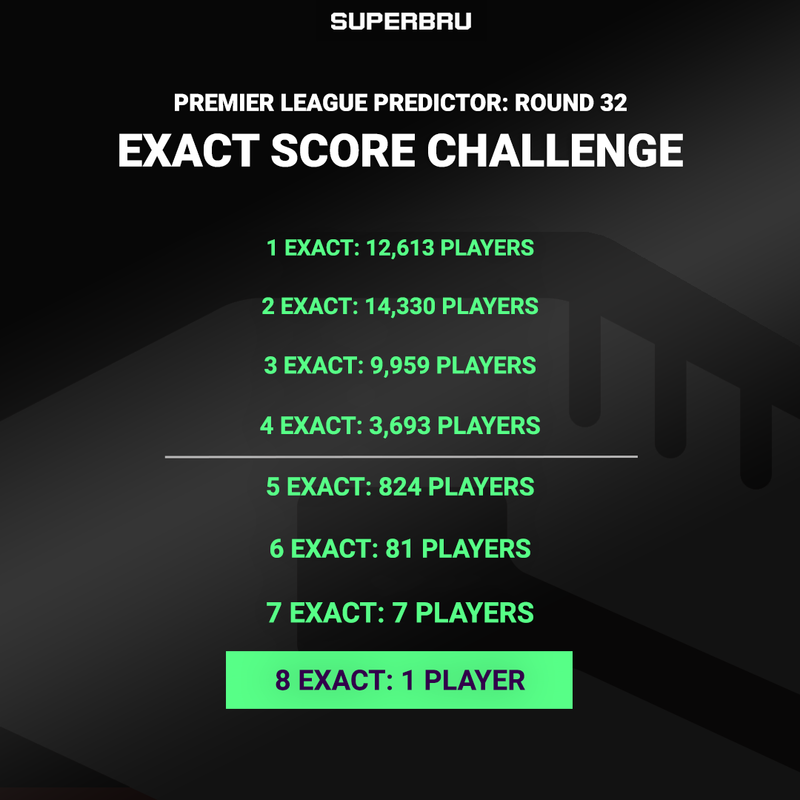 Premier League Round 32 Exact Score Challenge Winner! Round 32 of the Premier League has been eagerly anticipated for a while. The 15-game round means there's a great chance to make up ground in our predictor game, a huge opportunity to score big fantasy points and just a lot of football to watch each day. However, one thing that remains as tough as ever is our Exact Score Challenge since only the opening 10 games of this round count towards the sought-after prizes on offer. Incredibly, we don't just have a prize winner this week, we have the biggest prize winner of the season so far. Just imagine checking out your picks on a Monday evening and seeing that! 'Obi M' - a username that can't fail to remind you of the great John Obi Mikel - was just a Huddersfield goal away from 9 exact picks and even got a 'close' prediction for the 10th match between Liverpool and Spurs. After such an amazing feat, we were quick to get in touch with Obinna and find out how he'd managed to pull off such fantastic picks. It became very clear that he had done his homework. "Thank you very much, I am very grateful. I have been carefully watching these matches from last season to this season and I was able to note the strength and capabilities of these clubs and the result they can put on the table when played home and away, this is my pick strategy." "Although I have not been doing well in my picks, I never sold away my determination to be successful in making the right picks and here I am dancing to my success." Obinna went on to provide us all with further inspiration, encouraging everyone to continue trying to scoop a prize of their own before the season ends! "A very big thank you to Superbru for creating these wonderful opportunity for all football lovers, God bless. Also to the other registered superbru members? Determination is the key!" More prize winners between now and the end of the 2018/19 campaign is highly probable given that we've already had winners in 30 of the 32 rounds that have taken place. Obinna wasn't alone in making great picks this weekend as there were lots of you picking up exact scores. 7 very unfortunate players were just 1 exact pick away from taking Obi M to a tie-break for the cash prize while a total of 913 players were over that all-important 5 exact picks line. A huge congratulations to Obinna and well done to those of you who have also been nailing this Premier League round so far to climb your pool leaderboards. Please feel free to congratulate Obinna in the comments yourselves and best of luck to all in our Exact Score Challenge for the remaining PL rounds of the season. We love seeing members of our community doing so well like this. Thanks for playing, and well done on an awesome performance! Determination is the key! Thank you Superbru! Does this $1250 come out of Jack's or Hutch's pay btw? Also. if Obinna turns out to be the ACTUAL Jon Obi Mikel he clearly doesn't need the dosh! Can I suggest he donates it to 'Jersey-puller's Rehab Centre For Chronically Addicted Brus. (Try picking while wearing a straight jacket!). If only Jon Obi Mikel had been 80% accurate when playing for my Chelsea in the past. The words 'Backside, Banjo, Cow's & Couldn't Hit' spring to mind. Perhaps he just needed to remember "Determination is key!"? Well done Obinna! Congratulations bro. But am next! Very big Congrats. you are one of the genius wizards in the world. Thanks. And with only 182 caps... Hmmm???? Hi Ob Congratulationsi, you just gave me hope to continue!!! Well play my Brother, Congratulation. Congrats you deceive the prize. Great job. Well deserved. Have fun with the cash! Congratulations Obinna!! Do enjoy that prize..
WOW! A very big Congratulations!!! This was one of the best weeks for most superbru players. congrats Obi M!! Congratulations are in order. Keep it up. Well done brother, you made Africa proud! did wonderlik broer,jy is die ster. Well played. You owe Hugo Lloris a pint! Congratulations Obinna, go for the big one now. Cheers. Congrats its never easy to predict..wow!! Pls, share your contact with me too. Congrats Obi! Naija all the way!! Congrats Obi! That's insane. Well done! Nice picks Obi keep it up! Brilliant! Well done and congratulations! Wow so awesome, congrats Obinna. Wish u more. Well done my brother, it is a pride. Well done, but do they really pay out? You are wonderful bro,keep up. I am super-excited for you man. Big ups!!! I celebrate you BIG time. Many congrats!!! Bro, you really went super. Congrats!!! Bro, more success in the future. Congrats boss, but do you use juju?? WOW, that takes some doing. Congratulations. Awesome stuff! Keep it up. Wow that is great to see. We all are determined for the 10 exact picks!!! Mr foretell ....congratulations obi awesome ! Congrats Obinna. It’s your lucky round. Nothing can deny you that. This is really wonderful! Congratulations Obinna. Congratulations man, working to emulate your success! Congrats, buddie... Keep it up! Dis absoluut briljant, my Bru! Wow... A Big Congrats To You Brother.. And A Big Thanks To Almighty God Who Made It Possible For You..
congrats bro..give thanx.. wa gwan.. Awesome Chief, it is brilliant when a regular 'play for fun guy' does what seems impossible to the rest of us. Congrats my man, more grace ahead. I will be the next winner. Inbox me my share. This week was indeed a closely contested one. Even though my NAIJA bro made the difference you still cannot take away anything from those guys who got 5, 6, and 7 exact picks. You guys are all wonderful. Congratulations Obinna, enjoy your money. Obi Mo. Grats bru. Thumbs up on this one. Congrats. Well done on ur picks!!! Well done, Obinna - luck can come when you last expect it! Well done bro!god bless I'm next ten exact. Congratulations ma man obinna..God bless u.
Congrats buddy, happy for you. Sick bro, seriously well done!! Congratulations man! Weldone! Not easy but there you're! I'm also on the way for a big grab!!! Cheers!!! Great work Obi. Swap you for my cap! Congratulations Obi. This is a motivation for us to keep on trying. congratulation bro making nigeria proud. dont forget to come and pay ur tithe to me. I got 6 exact scores in this round. That's the highest I've scored. Congratulations to you, enjoy yourself. Congrats bro u are so lucky! In nearly 20 years of picking games the best Ive ever got is 4 exact in one week so to get 8 is an accomplishment...well done mate!...Ironically the 2 you didnt get exact were the 2 that I did get but no others...YNWA! Well done Obinna Mikel , This is a great achievement for you. you have set the standard now. Keep trying the Big Prize is in sight soon. Congrats and well done Obinna Mikel.